Former FARC Leader Arrested In Colombia On U.S. Drug Warrant : The Two-Way The former rebel commander and top peace negotiator known as Jesus Santrich is accused of conspiring to smuggle $15 million worth of cocaine into the U.S. 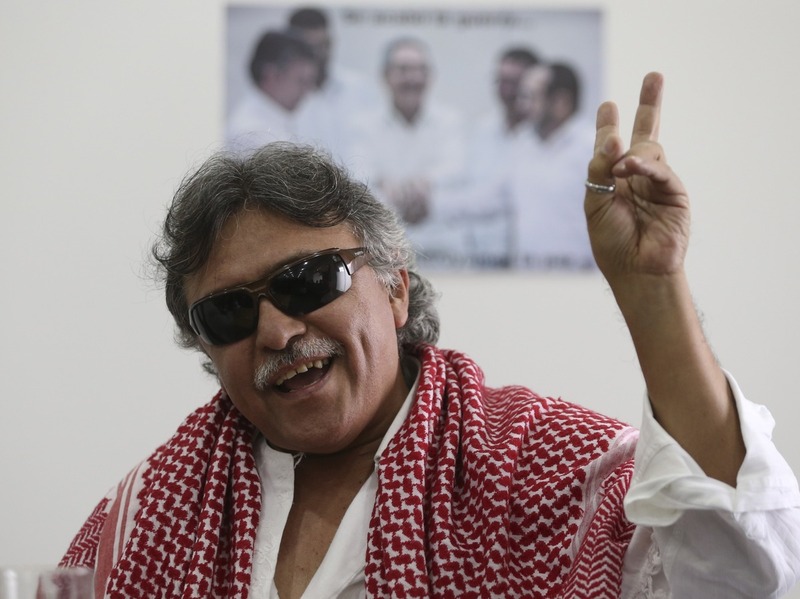 Revolutionary Armed Forces of Colombia (FARC) rebel commander Jesus Santrich flashes a victory hand signal at the end of a news conference in Bogota, Colombia, in 2016. Colombian authorities have arrested a former peace negotiator for the rebel group FARC on a warrant seeking his extradition to the U.S. on cocaine smuggling charges. Seuxis Hernandez, also known by the alias Jesus Santrich, was taken into custody at his residence in the capital, Bogota, on an arrest warrant issued by the U.S. District Court in the Southern District of New York charging him with conspiracy to smuggle $15 million worth of cocaine into the U.S., according to an Interpol notice quoted by The Associated Press. Colombia's government signed a peace treaty with FARC in 2016 and the rebel group subsequently disarmed and formed a political party. As part of the peace deal, the FARC party was given 10 seats in Congress until 2026. Santrich, who is blind, was set to take one of those seats in July. "This is the worst moment that the peace process has gone through," the former rebel leader and chief peace negotiator known as Ivan Marquez said, according to the AP. "The government has to act to prevent judicial set-ups like these from spinning out of control and generating a great deal of mistrust among all of the guerrillas." The AP writes: "According to an Interpol notice, Santrich met with cocaine buyers at his residence on Nov. 2, 2017, a day after one of his co-conspirators delivered a 5-kilogram sample of the narcotic to them at a hotel lobby in Bogota. During the meeting and subsequent negotiations, he and his co-conspirators allegedly discussed plans for a 10-ton drug shipment to the U.S., boasting they had access to cocaine laboratories and U.S.-registered planes to produce and move the drugs inside Colombia, the world's largest producer of the illegal narcotic." The Spanish-language newspaper El Espectador reports that after Santrich's arrest, Colombian President Juan Manuel Santos endorsed the extradition of the former rebel, noting that any immunity from prosecution covered by the peace agreement wouldn't apply because the alleged crime took place after it was signed. Santos said his "hand won't shake" in signing off on the extradition. "The construction of peace requires the absolute commitment and respect for the law and the accords," Santos said, according to the AP. "This is what the Colombian people demand. In this aspect, there can't be any room for tolerance or weakness."